In the debut album of Nepali fusion trio Kanta dAb dAb, the band explores youth and a hybrid sense of spirituality. The self-titled Kanta dAb dAb was launched two weeks ago, in tandem with a kickoff concert at Alliance Francaise in Kathmandu (pic). 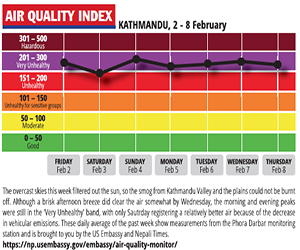 The band locates itself at the intersection between Newari tradition and influences of Western modernity. 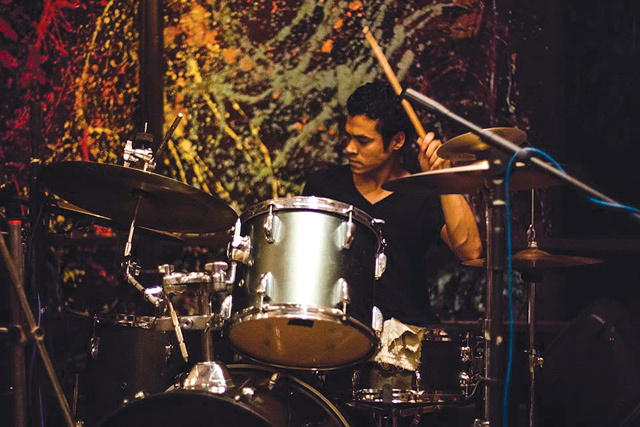 Bassist Rizu Tuladhar, drummer Nikhil Tuladhar and sitarist Sunit Kansakar grew up together in a Newari neighbourhood, playing gigs amongst Thamel’s live performance circles. Their mutual experiences of growing up and sharing two decades of their musical careers together are the foundations of what they explore through the nine tracks in Kanta dAb dAb. The name of the band and album stems from the mythical traditions its members grew up with. “We have one character called ‘kanta dab dab’ in our Newar community. It used to emerge during festival times, dressed up in red. But it never spoke a word. It was quite fascinating for us – very mystical,” recalls Rizu Tuladhar. The signature tracks of the debut album are ‘Escapade’, ‘Aatman’ and ‘Kelikula’. Crafting a new form of soulful fusion grooves, ‘Escapade’ ebbs and flows on a mystical line where Eastern and Western melodies meet. With the sitar’s leading melody and a restrained bass and drum, the track makes for an unexpected musical journey. ‘Aatman’ and ‘Kelikula’ both draw on nostalgic images of boyhood. While the former harkens back to sentimental flashbacks over a slow bass line, the latter evokes the image of a typical day for the three boys in their youth, freely running through narrow alleyways in Kathmandu Valley. 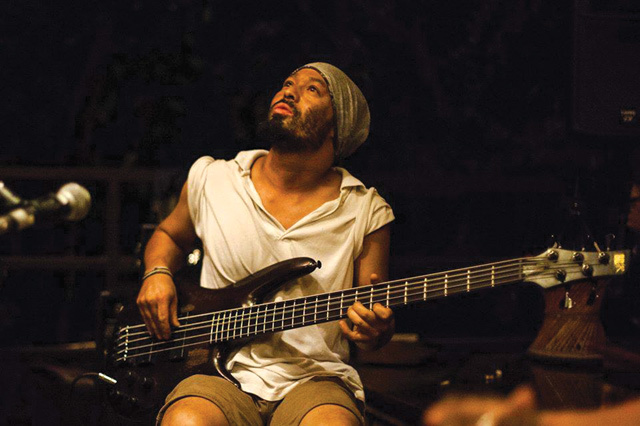 Moreover, the jazz-inspired track ‘Dab Dab’ carries a sophisticated flow; opening with bass and drum, and later joined by sitar, it slowly builds into a trance to the listener. 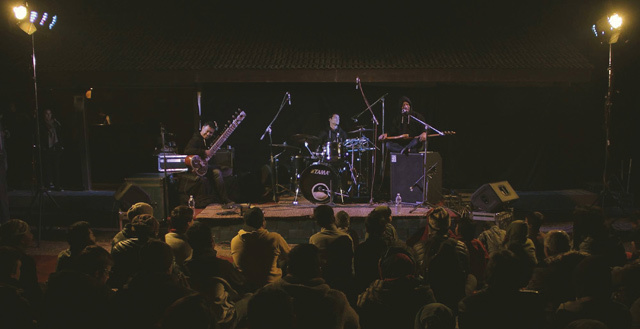 The album’s final track, ‘Malshree’, is the band’s rearrangement of a famous Newari traditional song played during the Dasain festival. A more simplified version of the original, it pays homage to the characteristics of the famous song by not fiddling with the main melody and rhythmic groove. In addition to its impressive first album, Kanta dAb dAb has also launched a ‘Musicians for Musicians’ project to promote and preserve the traditional musical heritage of Nepal. 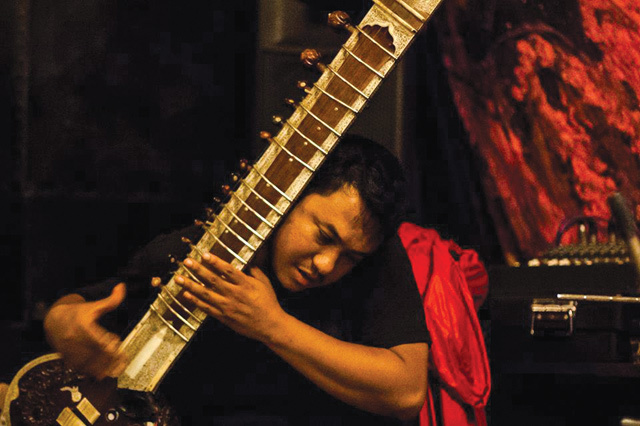 Teaming up with earthquake-affected Nepali musicians, this social-cultural project will conduct workshops and hold performances, leading up to the 2017 World Folk Music Festival in Kathmandu.